Trump, Bannon Maneuvers Could Threaten GOP Senate Majority Trump has criticized incumbent GOP senators while praising a Democrat who is a top GOP target. And Steve Bannon is threatening to boost primary challengers in GOP races, perhaps making 2018 tougher. President Trump and then-chief strategist Steve Bannon in April. They no longer work together in the White House, but they both seem primed to go to war with the GOP establishment. President Trump and his allies aren't exactly running the playbook Republicans want him to ahead of the 2018 midterms. And that could be costly for the GOP at the ballot box next year. Most recently, he has lashed out harder at his own party's two most vulnerable senators in 2018 — Dean Heller of Nevada and Jeff Flake of Arizona — than he has at any Democrat up for re-election. He has heaped praise on North Dakota Sen. Heidi Heitkamp, a potentially vulnerable Democrat, and made a deal — at the expense of Republican leaders he has publicly bashed — to raise the debt ceiling, a longtime anathema to conservatives. On top of that, Trump's pugnacious former top aide Steve Bannon, freed from the confines of the West Wing, seems primed to go to war with the GOP establishment by funding Senate primary challengers. That could mean Republicans are saddled with weaker general election nominees — complicating a cycle where the GOP has plenty of vulnerable Democratic senators to knock off and should be primed for pickups in the upper chamber of Congress. "Trump should be using his political capital in states like North Dakota, Indiana and Michigan to make the case for a more conservative Senate," lamented Brian Walsh, a GOP strategist and former communications director for the National Republican Senatorial Committee. "Instead, he's either complimented the senators or given them a free pass. Hopefully, that will change at some point, but you have to wonder when." 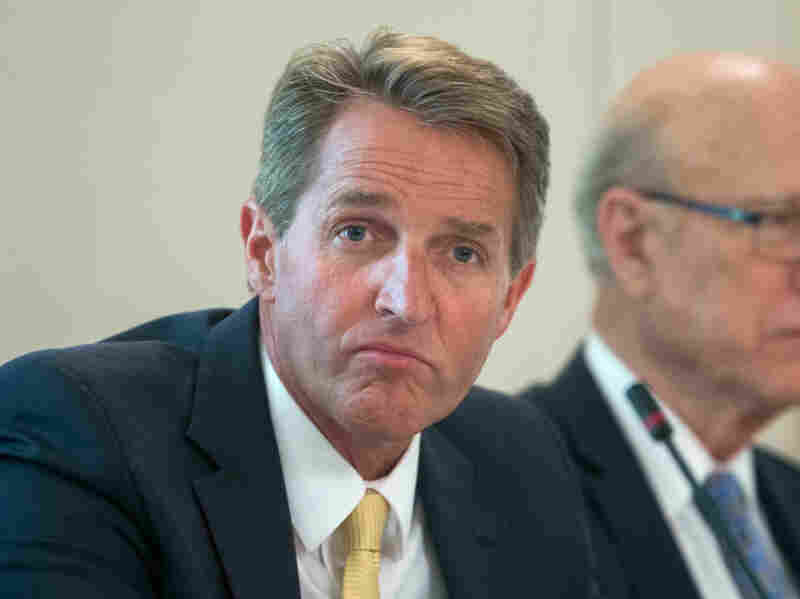 Trump has criticized Sen. Jeff Flake, R-Ariz., while praising one of his primary challengers. Politico reported over the weekend that Bannon is preparing to put money where Trump's mouth is, coordinating with conservative donor Robert Mercer to not just target Flake and Heller, but possibly even Tennessee Sen. Bob Corker, a onetime ally of Trump who was considered for secretary of state, and Mississippi Sen. Roger Wicker, the former head of the NRSC. Corker told reporters this week that he hasn't made up his mind as to whether he will run for re-election. Bannon promised on CBS News' 60 Minutes that he was ready to go to war with the GOP establishment and Senate Majority Leader Mitch McConnell of Kentucky. "They're not going to help you unless they're put on notice they're going to be held accountable, unless they help the president of the United States," Bannon said. "Right now there's no accountability." The problem is: What should be an incredibly favorable Senate map for Republicans — with more than double the number of Democrats up for re-election than Republicans, including 10 incumbents in states Trump carried in 2016 — could be turned on its head if Flake and Heller are replaced with weaker nominees and put the GOP's three-seat advantage in peril. Charlie Cook of the Cook Political Report wrote Tuesday that if there is one "weak spot in the Republican firewall" that is the Senate, it's the possibility that "Heller, Flake, or some other GOP incumbent either loses in the primary or becomes so badly damaged that he is unelectable, then the Democrats have an opening." And Senate GOP observers privately warn that if that happens — and if far-right conservative nominees win primaries to face Democrats in other races — the Senate majority would be very much in jeopardy, which would only cause Trump more headaches, especially if the House were to flip too. That would open up unyielding investigations into the White House and possibly jump-start impeachment proceedings. Because of those calculations — and with Bannon no longer having the president's ear directly, even if they still talk now and then — plugged-in operatives think Trump will eventually come around to supporting the party's nominees and incumbents. Already though, the president hasn't been shy about lashing out at Heller and, especially, Flake. The Arizona senator invited plenty of ire with his book Conscience of a Conservative: A Rejection of Destructive Politics and a Return to Principle, which was a direct criticism of Trump and his populist principles. In turn, ahead of a campaign visit to Arizona, Trump blasted Flake and praised one of his primary rivals, Kelli Ward. Ward lost in 2016 to Sen. John McCain in the primary, and Republicans back in Washington, D.C., don't view her as a strong general election candidate if she were to defeat Flake. 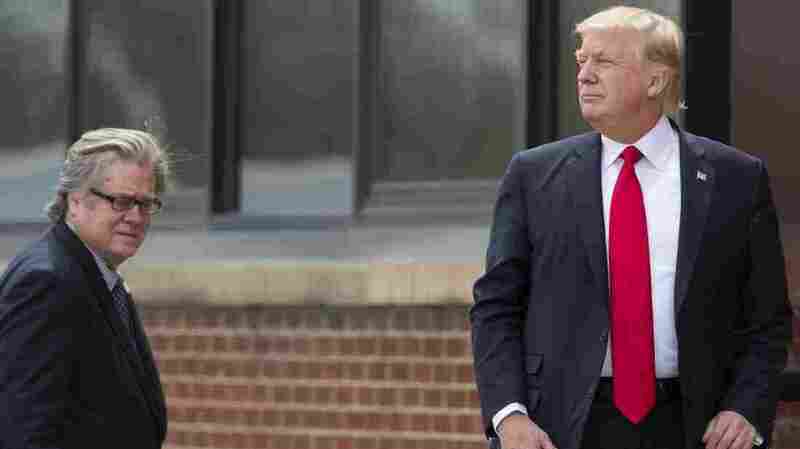 Some Trump allies have already rallied around Ward, but several other challengers could still get in the race. Heller was on the receiving end of negative ads from the pro-Trump group America First Policies when he came out against the initial Senate bill that would have repealed and replaced the Affordable Care Act, or Obamacare. Heller eventually came around on a revised bill, though that ended up failing to pass anyway. 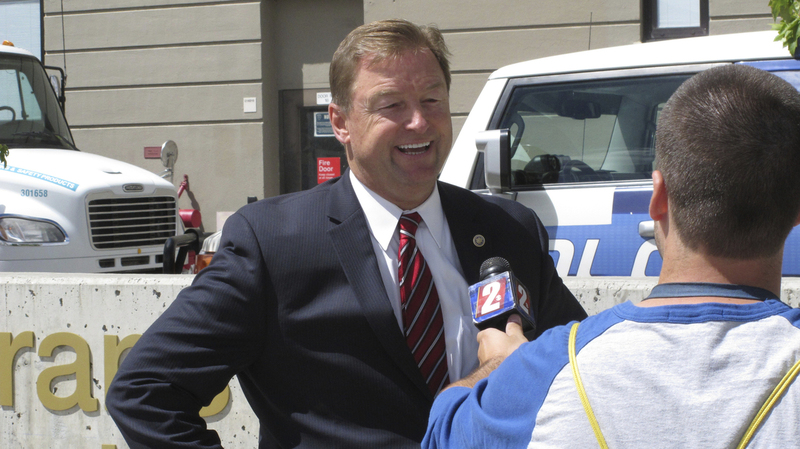 Sen. Dean Heller was targeted by the pro-Trump group America First Policies when he came out against the initial Senate bill that would have repealed and replaced the Affordable Care Act. The primary threats are deja vu for Republican veterans who lived through past cycles where winnable races slipped through their fingers because of similar internecine wars. In 2010, weak candidates, mostly aligned with the Tea Party movement, prevailed over party favorites in places like Delaware and Nevada helped Democrats hang on, despite a broad GOP wave. Two years later in Indiana, conservative favorite Richard Mourdock knocked off incumbent Sen. Richard Lugar in the Republican primary, but gaffes and other baggage helped Democrat Joe Donnelly defeat Mourdock in the general election. Donnelly is up for re-election in 2018, and the president — who won Indiana by 20 points — is pressuring Donnelly to support a GOP tax plan. Even in races where incumbents were successful at fending off Tea Party challengers — like Sen. Pat Roberts in Kansas and Sen. Thad Cochran in Mississippi in 2014 — officials still bemoan the time, energy and money that was spent having to shore up their incumbents instead of focusing all their fire on Democrats. "When Steve Bannon and his donors are attacking Republicans and Democrats, they are actively helping [Senate Minority Leader] Chuck Schumer," said Walsh. "At a minimum, you're wasting precious resources in a cycle in which Republicans should almost uniformly be on offense across the map. This is attention, energy and money that ought to be focused on growing the Republican majority, not splitting it." If they have to, national Republicans say they're prepared to have to bolster their incumbents again in primaries. "The NRSC's long-standing policy is to help re-elect our incumbent members to ensure a strong Republican Senate majority for years to come," said NRSC communications director Katie Martin. At the heart of the concern for Republicans is the fact that Trump's marriage with the GOP has long been one of convenience, and he has made clear — through the campaign and his rocky first eight months — that he is concerned most for himself, not the greater party. That explains, in part, the mass exodus of many House GOP centrists recently — Florida's Ileana Ros-Lehtinen earlier this year, and then, in the past week, Washington's Dave Reichert, Pennsylvania's Charlie Dent and Michigan's Dave Trott have all said they will call it quits, putting all their seats in play. "There are groups out there that profit off of this type of instability and uncertainty and chaos. And they put a lot of pressure on members of Congress," Dent bemoaned to NPR's Scott Simon on Weekend Edition Saturday. "I would tell you there are members in — both political parties right now have some very serious challenges. They're being pushed into some bad directions. And we need to have a stronger voice from the center of the political spectrum." But if Bannon's wishes come true, it's those voices near the center that could voluntarily bail out or be extinguished by voters next year — complicating what could be a tough 2018 midterm election for Republicans.